Cream cheese makes these classic chocolate chip cookies extra special. 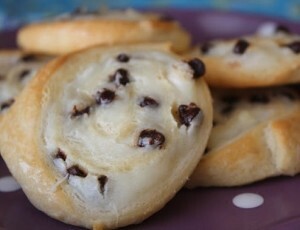 Here is an easy dessert recipe for Cream Cheese Chocolate Chip Cookies. Combine flour, baking powder and salt in a medium bowl; set aside. Cream butter, cream cheese and sugars using an electric mixer until light and fluffy. Blend in egg and vanilla. Add flour mixture and mix well. Fold in chocolate chips until just combined. Drop mixture by spoonfuls on non-stick baking sheets, about 2-inches apart.